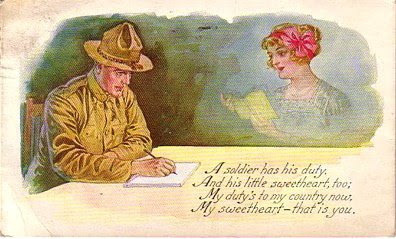 The WWI letters of Manhattan, Kansas sweethearts during the winter of 1918-1919. I tell Minnie we are still being trained. I also mention something of the entertainment at Camp Funston. I will hurry & write what I can before the entertainment begins. There is to be one of some sort tonight. There isn’t much news. We just keep drilling as usual. I don’t see what good there is in having the war over the way they continue to train us. We had our dinner in the field as usual today but about two o’clock instead of going right to drilling they assembled the whole regiment around a truck & we sang songs. Lieut. Guthrie led and the regimental band accompanied. It was rather cold today & especially this morning. We noticed it because we worked up a sweat marching to the field & the problem that we were out necessitated our being idle for about two hours because E Company formed the reserve of a line of outguards. We laid around behind rocks on the hill side out of the wind & piled up like pigs trying to keep warm. Tomorrow we go out to drill with our overcoats on. We signed the payroll tonight but we won’t get our pay until after the first. Our Company goes on guard tomorrow but I missed it this time. I expect I will have to go on sometime when I want to get off on a pass. I stopped to listen to a lecture on “Valley Forge” & when I looked around for my fountain pen someone had taken it. It was an illustrated lecture & was pretty good but the best part of the entertainment was an imitator. I heard him once about six years ago at a Chautauqua at Manhattan. He sure was fine. He would imitate things from the country & he almost made me homesick. He imitated roosters crowing, hens calling their chickens, cows, pigs, bees, etc. Why, he could fool the animals themselves. I tell my mother and brother it's possible I might get a four-day pass to come home for Thanksgiving. I don’t see any use in having the war to stop the way they are drilling us. We are still drilling as hard as usual. There isn’t much news to write about – just the ordinary everyday life. We go on guard next Thursday and I suppose that I will be on this time because I wasn’t the other time. Monday there was an order posted that 2% of the actual drilling force of the company would be granted 4-day passes each day beginning Monday. I went in to put in for one but he said I would have to wait awhile because I had had passes. Maybe I can get mine sometime near Thanksgiving. I sure hope so. Lots of the men are so far from home that they don’t care for even 4-day passes. Others say that they don’t want to go home until they can go and stay. Most of the men think that we will be discharged before so very long and I think so too, but of course we may not. P.S. I don’t suppose that I will be able to get a pass next Saturday. I tell Minnie I celebrated her birthday by pulling K.P. Well it has been quite awhile since I have written something to you & I ought to be able to write a long letter & I have thot of lots of things to write about but when I go to write it down, there seems to be nothing interesting. I haven’t gotten a letter from you for a long time & I know that you haven’t received many from me this last week so I guess we are even. Last Saturday was your birthday. I wonder how you celebrated it. I celebrated in the kitchen. I came back from the rifle range Friday & they put me on K.P. right off the range. Each fellow has to take his turn at it. While I was taking the fatigue clothes off the spuds & stirring the slum, I thought of you & your advancing years with tears in my eyes knowing full well that you would be a whole year older before I could enjoy your presence once more. Friday afternoon after I got back, I went into the orderly room to put in for a pass. He asked me if I had one last week. I said I did & he said I couldn’t have one this week. I couldn’t have used it till Saturday night anyway being I was on K.P. Well, I didn’t get very down hearted about it because the weather was so [bad] that night. The top sergeant (he is the gent that says yes or no) was in the kitchen. I accosted him at a very psychological moment, just after he had partaken of a very hearty supper & asked him again for a pass. He told me to come into the orderly room & he would fix me up. So I rolled down my sleeves, took off my apron (flour sack), slicked down my hair, knocked on the orderly room door (if you don’t knock, maybe you get a pass & maybe you don’t) entered, closed the door, popped my heels together, & snapped out a salute that would be the envy of any previous service man in the army. All this was done with the usual grace & elegant bearing of our gallant here. Well, I got my pass & reached town about 8 o’clock [Saturday night]. I phoned out home & mother said that [my brother] Willis had already gone to town but went on horseback. I hunted around for him for awhile but couldn’t find him & so went to a [picture] show. You know you said that you were going to a show this time so I had hopes of seeing you inside as well as Willis. I found Willis just as I was ready to go home but walked out from the end of the car line anyway. If I didn’t walk just about so much every day I wouldn’t feel right. I wish I could have seen you last Sunday before we start for Utah, if we go. We heard that the 20th [Infantry] was going back to Ft. Douglas at Salt Lake [City], Utah for the winter. I would like to go but I am afraid we won’t. 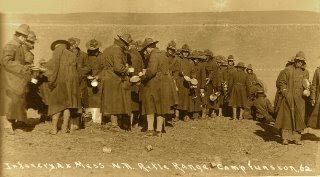 I think that we are more liable to stay right here in [Camp] Funston until we are discharged. The 20th [Infantry] came from Ft. Douglas & most of the boys are wild to get back there. Many of them are enlisted men & will not be discharged until their time is up. They were sure disappointed that they didn’t get to go across [to Europe] because most of them have been training for over a year. I want to go mighty bad but now that the war is practically all over, the sooner they discharge Pvt. Ward Griffing, the better suited he will be. We got up at five o’clock this morning & went out to the field with our dinners in our haversacks: 1 sandwich & 1 hard boiled chicken in the shell. They are issuing four day passes again & I went in to see if I could get one soon. They said I would have to wait for a week or two because I had had two passes already. I hope I can get mine about Thanksgiving time. [P.S.] This is my last sheet of paper. My mother writes Minnie to tell her they had a nice visit with me. I talked my way into a pass Saturday evening and came home to Manhattan for the rest of the weekend. Willis, Carol and I took Ward downtown tonight for him to take the [interurban] car back to [Camp] Funston. He would have waited until morning but he felt that we all would have a better night’s rest if he left tonight. Then too, the visit does not amount to very much while we sleep, or try to. He did the same way last week and got up there before the lights were out. For cold weather, I think likely it is really the better way to do although we always want him to stay as long as possible. He was going to write to you this evening, got his paper and pen, but we talked to him so much that he did not get it written. So I thot just for fun I would send you a little note. I want to congratulate you for your birthday and to wish for you many many more and that they may be very happy ones. I am thinking that likely some little girlie was rather lonely and blue last night and today. It has not been a very pleasant day and one is likely to be more lonely at such times. I trust that something happened to make the time pass pleasantly for you. Ward said that he is likely to have to winter in Utah [and] that they may have to leave [Camp] Funston between the 20th & the 30th [of November] from what he has been hearing. It is too bad that Stella [Munger] has been sick. It will make her school quite late in the spring. Our birthday club met with Mrs. Taylor last Friday and as usual, Kate was very anxious to know what Ward thot about the boys having to go across [to Europe] and when they would likely get out, &c, &c.
Ward said today that he rather believes that he may get out in time to help Willis on the farm some next summer. We are certainly hoping so. Claude [Cunningham] was up to see the Taylor’s yesterday. He said that they were to have gone up to see Mr. Blair’s people today if it had not stormed [and] that his father has bot a farm for him to go onto as soon as he gets out of the army. Well I wonder if you are not tired of my scratching. 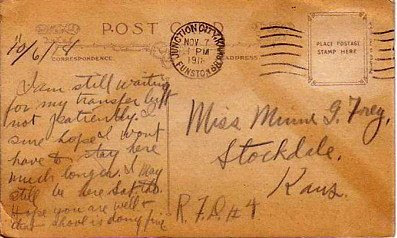 Minnie writes me a long letter from Parkerson's farm in Sherman Township, Riley County, Kansas where she is boarding. She tells me she became scared during a storm while alone at the Parkerson’s and ran to a neighbor's farm. The wet weather and the muddy roads prevent our getting together this weekend. We sure have had a siege of bad weather up here this weekend. I had planned to go home today. Mr. [William] Hoffman was going to Stockdale so I was going that far with him and then take the train home. But it was so muddy and cloudy, I was afraid I wouldn’t get back. I’m sure disappointed. I wanted to be home [on] my birthday and then I had so many things to buy for my school. I wonder very much where you are. I hope you write pretty soon. I haven’t heard from you since I came up here [last Sunday evening]. I don’t understand. The paper says they didn’t send any of the 10th Division away after the Armistice was signed but I know you have left [Camp] Funston or you would have written to me. I wrote Mama this morning and asked her if your folks knew where you were. Thursday, Parkerson’s went to Manhattan. Mr. Parkerson went to a sale over across the river so they didn’t get started home till late. Then they had a blow out near Stockdale. Well, I knew they intended to get home early because Mrs. Parkerson didn’t make any arrangements for me to stay anywhere as she always does when she thinks they will be late. So I came home from school and expected to see them coming any time, but they didn’t. Well, it got real dark. I lit the light and thought I would build a fire and start supper. Well, the wind was blowing and the cows were bawling and this house seemed so big and lonesome. I began to get cold feet. Knowing what a coward I am after dark, you can imagine how scared I was getting. Pretty soon the dog barked up. I jumped and blew out the light and off to Hoffman’s I ran. [When the] Parkerson’s got home later, they called to see if I was there. Kenneth [Hoffman] brought me home then. That day the [Krause] twins asked me if I wouldn’t go to the revival meetings with them. I told then, “Sure I would” but it was so rainy and bad Mrs. Krause called and said they had decided not to go. A week from next Wednesday is Stella [Munger’s] box social. I hope it’s nice weather so I can go. Mrs. Parkerson is going to Kansas City to visit her daughter. She asked me tonight if I would stay with Chalmers' or Krause’s. I told her yes, certainly I would. She seems to hesitate so about leaving while I’m here. I may have my “shes” mixed up but I guess you can make it out. Tonight’s the night I had planned on going to a [picture] show in Manhattan. Maybe I can next Saturday night. I’m sure going home then, rain or shine. I can’t hardly stand it to stay here over weekends – this is the second time. It wouldn’t be half so bad if I would get some mail. The mail man didn’t come today, but Mr. Parkerson got the mail at Stockdale. I was sure anxious for him to get home. I thought I would get a whole handful of mail – this being my birthday. I thought sure Mama, Stella [Munger], and you would write. Mrs. Parkerson hated it when she did tell me. But I think the folks expected me to come home until it rained so last evening. Ward, you remember Capt. Willis [L.] Pearce that carried mail on Route 8 for ten years? I noticed in the paper tonight that he was killed in action October 9th. And that Riley County boy [named Henry Uhlenhop] that was reported dead the same time George Wingate was killed is alive. His folks got a card from him last week. He’s in a German Prison hospital. They think it may be that George Wingate is alive yet [too]. Neither one of the boys clothes were sent home. And they always are [once their bodies are found]. Capt. Willis L. Pearce served in Co. F, 142nd Infantry. He was killed in action on October 8, 1918 while serving in the 36th Division's efforts to push the enemy from the area north of St. Etienne-a-Arnes (specifically, Hill 140) back to the Aisne River. The division was successful but Americans suffered heavy losses in their first action under fire. Willis was born in Kansas about 1882. His father was a farmer in Grant, Riley County, Kansas at the time of the 1895 Kansas Census. Willis is buried in Arlington Cemetery, Section S W Site 4348. George L. Wingate was born on August 5, 1894. The August 22, 1918 edition of the Manhattan Tribune reported that George was the first Riley County soldier killed during the war. He died leaving a wife and a baby that he never saw. Prior to his enlistment in 1917, George was a farmer near Ogden, Kansas. Henry Uhlenhop was indeed reported dead and the whole village of Leonardville, Kansas, mourned his loss at a funeral conducted shortly afterwards. He later turned up in a German Prison Camp where he had been well cared for by the Red Cross. He won the Croix de Guerre in the Second Battle of the Marne. He became the postmaster in Leonardville following the war. Minnie writes me on examination day in her school. Today is examination day. I sure pity the kids. I know how I used to hate them. I haven’t only a little time to write this morning but I guess it doesn’t make any difference for I haven’t anything to write. I have to go to school a little earlier than I used to. One of the little girls is taking to getting to school about twenty minutes after eight or before. Parkerson’s are going to Manhattan today. I wish it were Saturday. Then I could go along. School is going fine. But that little Dorothy Condray tells the biggest stories. She told her mother one night when she got home real late that the teacher made her stay in till dark. That was all a falsehood. I didn’t do anything of the kind. But her mother thinks it’s true. It’s a little cloudy this morning. I suppose it’s going to get colder. It’s been so nice this week. I certainly expect a change. Let’s see. Didn’t you say that if I didn’t hear from you for 3 days, I could quit writing till I did get one? Well I haven’t heard [from you] yet and I’ve been here three days. I guess I don’t need to send this. I think I’ll go home Saturday noon on the Blue Valley [Railroad] if I can get some one to take me to the crossing. I’ll have to borrow some money to get home on tho. I forgot to bring my pocketbook and I only have two dimes up here. I’ll have my pay but that won’t do me any good till I get somewhere I can cash the check. I write Minnie about training again on the rifle range. I still hold out hope of going overseas and don't anticipate being discharged until next spring despite "Kaiser Bill's" defeat. This letter to Minnie is a near duplicate to one I wrote my mother on the same day from the Camp Republican "Y." I have only included here, in parenthesis, the one sentence that was different. I expect you must think by now that I must have left Funston. I might as well have so far as writing accommodations go. As soon as I had breakfast Monday morning, I had to make up my pack and start to march out to the rifle range. [It is a long ways out there, especially when you are taking nearly everything you own. But I rode on a truck part of the way and a taxi part of the way.] Some of the other men of my company went out Sunday night but as I happened to be somewhere else, I didn’t go. I didn’t take any writing material but if I had, tonight is the first time I could have written because we have sure been working. We have been shooting at night as well as all day as long as we could see the target. Last night we had to shoot with our gas masks fixed. I used to think it was lots of fun to shoot that rifle but I have shot so much now that it is an old story. We don’t get any too much to eat while we are out here. For dinner yesterday we had 1 cup of coffee & one bologna sandwich. Today we had 1 slice of bread, a few beans, coffee & hardtack. Bread and beans for dinner and beans and bread for supper. Monday night I nearly froze. We got in so late we didn’t have time to fill our ticks with straw & with only 3 blankets; I tell you it was somewhat cool. I haven’t had a bit of mail since last week Tuesday & I probably won’t get any until I get back to Funston. I don’t know when that will be but I think we ought to be able to finish the course by Thursday night & get to Funston Friday. We are on the 500 & 600 yard range now. Well how do you feel about the way Kaiser Bill is cutting up now? He is a little slow about running but he finally did it. I think he was afraid of the 20th [Infantry] after I was transferred into it & thot he ought to get out before we came over. No one is allowed to go across unless their range record is complete so it was necessary for me to get right out on the range. Our Lieutenant said that the war looked a [hell] of a lot from being over & that we also looked a whole lot more from being out of the army. It is mighty hard to tell what they will do with us fellows but I was hoping to be let out sometime next spring. I don’t know whether we will stay at [Camp] Funston this winter or not. I sure hope I hear from you soon. Are you going to make up your school work? We have been fortunate in having good weather for target practice because some of the regiments had to shoot during that rainy weather & it made no difference whether it was raining or not, the men had to shoot. They are playing a Hawaiian piece on the Victrola here in the “Y” and it makes me almost homesick for a big armchair in front of a fine big fireplace not many miles from here. Minnie writes me the latest news from the Parkerson's farm where she is boarding in Sherman Township, Riley County, Kansas. I read in yesterday’s paper that they were going to keep the boys at Camp Funston drilling and going on just the same until they had orders from Washington telling them to do different. So I suppose you are still over there at Funston. Isn’t this the grandest weather? It corresponds to the feelings of the people. I am writing this in the kitchen and in rather an uncomfortable position for writing. I had a letter from Mama and Stella [Munger] yesterday but none from you. Mama sent the letter with your address. I received the bi-monthly examination questions yesterday so we will have that tomorrow and the next day. I will sure half to work some if I get to go home Saturday. I’ll have all those papers to grade first. President Wilson said the war was over because the armistice made it so they couldn’t renew hostilities. Most people seem to think the 10th [Division] will go across [to Europe] anyway. But people don’t always think right. School is sure going fine and just a little over four months yet to teach. May go to the Dutch church tonight [for] revival meetings. I wonder how long it will take them to pray the Kaiser out of purgatory. I’m sure going to a [picture] show the next time I go home. I’d sure like to see a real good one. Stella [Munger] says she goes in with [your brother] Willis and sure did have a good time. It made me want to go. I receive a pass to leave camp on November 9-10. I surprise Minnie by driving up to Sherman Township and bring her home to Manhattan for the weekend. Minnie writes me following our visit, beginning her letter on Monday evening, November 11, and finishing it the following morning. She tells me that news is received of an armistice. Well I suppose you are still at Camp Funston. You know Ward you wrote your address on that letter and I left them laying there on [the] dining room table. But I guess I remember your address. I ought to as many times as you have told me. Well today has certainly been a hurrah old time everywhere – the stores were closed all day. Parkerson’s went over to Leonardville [Kansas]. I wish I could have gone somewhere but didn’t get to. They gave the general ring early this morning before I was up. Then Mama called tonight about five o’clock but I wasn’t home. I came home from school tonight by moonlight. She said they had been [celebrating] in Manhattan all day. My, just think how many happy people can go to bed tonight to rest their first night of peace. Of course we don’t know what may happen when it comes to talking peace, but certainly the worst fighting is over. I must go to bed, it’s 10 o’clock. I’ll write more in the morning. I had to write to the folks tonight. I want Mama to get something and send me for my teeth and gums. I can’t hardly talk, they hurt so bad. (A bad condition for me to be in.) Goodnight dear Ward. My, but this is sure a swell day – just like spring. I wonder if you will get a pass again Saturday. I should think you would. Are they going to send any of the 10th [Infantry Regiment] away or keep them drilling right there? They are having revival meetings up here on the hill. We may go some evening this week. I wish I could be in Manhattan yesterday and today. You said you bet the folks didn’t like it because you came after me Saturday. I don’t remember what I said, but you sure don’t need to think that they weren't glad. Some of them would have come for me that evening if you hadn’t so they were glad you came. Then they thought I would be so surprised and glad to see you that they wanted you to come. The Allied powers a signed a cease-fire agreement with Germany at Rethondes, France on November 11, 1918, bringing WWI to a close. Between the wars, November 11 was commemorated as Armistice Day in the United States, Great Britain, and France. After World War II, the holiday was recognized as a day of tribute to veterans of both world wars. Beginning in 1954, the United States designated November 11 as Veterans Day to honor veterans of all U.S. wars. The Manhattan, Kansas newspapers reported that the largest crowd that the oldest inhabitant ever saw in Manhattan gathered on Monday afternoon, November 11, to celebrate the coming of peace and the burial of the Kaiser and Crown Prince and Von Hindenberg. The news came by A.P. service at three in the morning and was announced by blowing of whistles and ringing of bells. At nine o’clock the celebration started all over again. Possibly Lloyd or Glen Wickstrum, the young sons of Charles and Nancy Wickstrum of Sherman Township, Riley County, Kansas. Minnie writes me about plans for a Christmas program at her school. Well I wonder where you are. It’s sure turning cold and it’s awfully muddy up here. I was mighty glad this morning [that] I had my high top overshoes. Tonight the mud was so deep and thick I could hardly drag my feet along. But we sure have a good stove at the schoolhouse. I can build a fire in it easy and it warms up in just a little bit. We decided today we would have a box social Christmas, have a Xmas program and Christmas tree about six weeks from now. We’re going to begin on our program right away. We are going to begin cooking Monday. Tomorrow evening we will appoint assistant cook and general helpers and decide on what we’ll have to eat. I hope they want soup all the time. I’m afraid the cooking will bother me more than my school work. I like to cook and think it will be fun. But there’s such a bunch of them. I’d hate to fix up a mess they wouldn’t eat. I had a letter from you today. We came very near not getting any mail. I didn’t think we would. I don’t know whether I told you or not that the mail man up here doesn’t deliver the mail at all when it’s so he can’t take his car. They didn’t get any mail up here a couple of days last week. Sometimes he don’t go for quite a spell. So that means this winter Ward G. won’t get any letters from M. F. for awhile because I can’t send any out. But I’ll be worse off than you because I’ll not get any mail – not even the papers. He came today about 4 o’clock, went part way, then turned around and went back. I don’t ever see how he made it this far. My, but the war news is great. I’m not going to tell you that trade last till you come back to stay after the war is over. I’m not lonesome. I’m getting used to it up here or at least I’m not tonight. I’m feeling so good. I feel that the world is just more than treating me good. May[be] you would to if you had been reading what I just have been. I don’t care whether I get to go home or not this week and since I can’t get there to see [my sister] Bertha off (or at least I don’t think I can), unless you should get your gun clean enough to pass inspection. I think that’s pretty poor, Boy. I’ll bet if that’s all that stood between me and my seeing you, I would have that gun clean if it was possible to do so. And you will too. If you don’t come home Sunday, I’m not going to think it’s because your gun didn’t pass inspection. If you do come home, I hope I get to see you. If you get home Saturday or Sunday morning, and the roads are anywhere near decent, let the folks know you are at home and maybe they’ll come for me. But I guess you won’t get their letter before you would leave if you go Saturday. They don’t seem to think up here that we ought to have any more than just one day off Xmas. I would like to have more. I’m not much afraid to bet, Ward, that you’re home to stay before I am, unless they keep you in the service for quite awhile after the war is over. I read in tonight’s paper than Harlan Sumner has been located in a prison camp in Germany. My, but I’m anxious for you to have your picture taken in your uniform. It will sure be dandy. And won’t we be proud of it tho, or more especially, the person it represents. [P.S.] I hope wherever you are boy, that you are well and happy. That counts for more than anything else. A box social was a fund-raising event in which donated box lunches were auctioned off. Minnie writes me that the school board worked all day repairing the Sherman Township school house where she teaches. Well isn’t this a stormy old evening. My but the weather acts funny. I waited at the schoolhouse tonight till one shower was over then I started home. I sure did get soaked. It rained awfully hard here tonight. The school board worked all day at the schoolhouse today doing what they should have done during the vacation. They put new latches on all the windows and new screens. Also fixed the pump. School’s going just fine. Nothing very exciting happens. But I just can’t get over Ray’s leaving school. It never can be so interesting without him. If it hadn’t rained Parkerson’s were going to Alta Vista [Kansas] tomorrow to attend a sale. I was going to stay at Mr. Scott’s till they came home. I’m rather sorry they’re not going. I would like to go down there. I got four letters today but none of them was the letter. I don’t suppose I will hear from you for awhile tho – unless you wrote before you were transferred, if you were transferred. ‘Round Robin’ came today. I sure like to get [it]. I hear from all the girls that way and it’s sure a lot of reading. They all write so fine so as to get a lot in as small a space as possible. If it don’t stop raining I’m afraid I won’t get home this weekend. But of course there’s plenty of time for it to do that. My, but I hope you are at Camp Funston, Boy, and not a thousand miles away or on your way for a distant camp. My, as I sit here thinking, I just wonder where you might be. I have no idea whatsoever. I wonder how Willis’ hand is? I sure hope it gets well quick. I write my mother and brother to let them know I'm still at Detention Camp 2 (Camp Republican) and that we hear peace may soon be at hand. I got your letter tonight that you wrote Tuesday. I have been anxious to know how Willis’ hand was getting along and was glad to learn that it was alright. It is bad weather tonight. I hope you have gotten the hay up. Have you found those lost calves yet? I am sure getting tired of waiting for a transfer. About 17 or 18 are to be transferred tomorrow but I am not one of them. When this war is over and someone asks me where I fought and in what organization, I hope I won’t have to tell him I was in the Depot Brigade all the time and only fought bed bugs. I heard that the 10th Division has stopped moving until further orders. I suppose the reason for that is because of the German Peace Note. Things seem to be dragging out here as tho there was no need of hurrying up the training of new men. It looks as tho the Allies would have an easier time of invading Germany now than ever before and they may be able to do it shortly. I am still waiting for my transfer but not patiently. I sure hope I won’t have to stay here much longer. I may still be here Saturday tho. Hope you are well & that school is doing fine. 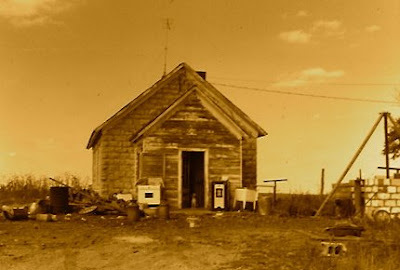 Minnie writes me about her school house repairs and Eben Scholer’s visit. Isn’t this the craziest weather? Looks so rainy and it’s just as warm as summer this morning. I wish it would clear off and stay clear. I want to go home Friday evening right after 4 o’clock. School is going fine. The children seem to study better than before. I don’t half to speak severely hardly to any of them. It’s just great. Mr. William Chalmers came up to the [Sherman] school house yesterday morning to bring some water. Our pump needs new leathers and we can’t get any water till it’s fixed. He said, “I hear that ‘spooks’ visited the school while you were gone.” He said he would get new latches for all the windows and get new screens for those that need it. The people couldn’t get in thru the windows anymore. Isn’t the war news great, Ward? I’m sure anxious to see today’s paper. Last evening, the [Topeka] Capitol said that peace may come in 24 hours. If Germany accepted the terms, the Allies lay before her. I sure hope she does. Of course if she doesn’t, she can’t struggle on alone very much longer. But I’m so anxious for Germany to surrender. I wonder if you are still at D[etention Camp] 2 or if you have been moved. Eben [Scholer] came up here with us Sunday. I told them before we left that I bet Parkerson’s would think he was you. They did too. Mr. Parkerson talked quite awhile to Eben and didn’t know but what it was you till after they left. Mrs. Parkerson thought so till she was introduced to him. I am sure glad to be back up here. I must go to school. 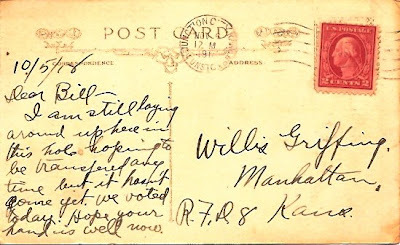 Goodbye Ward, -- Minnie G. F.
I send my brother Willis a postcard on election day. I screwed up and dated the card as October, however. I am still laying around up here in this hole hoping to be transferred any time but it hasn't come yet. We voted today. Hope your hand is well now. 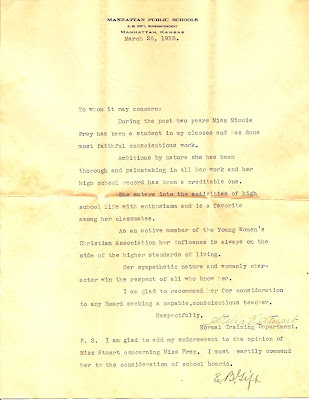 Minnie G. Frey's Letter of Recommendation for a Teacher's Certificate following graduation from Manhattan Public Schools. 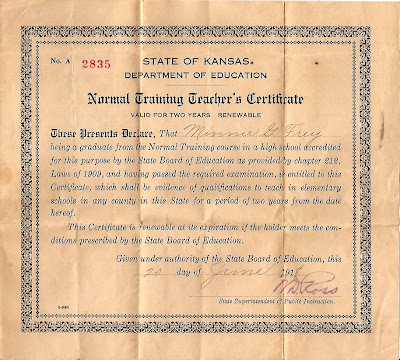 Minnie G. Frey's State of Kansas Teacher's Certificate. 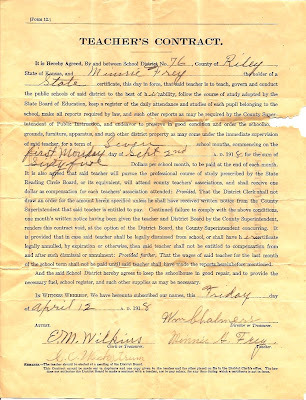 Minnie G. Frey's Contract to teach school for seven months at $65/month. Two views of Minnie G. Frey's hand held school bell. 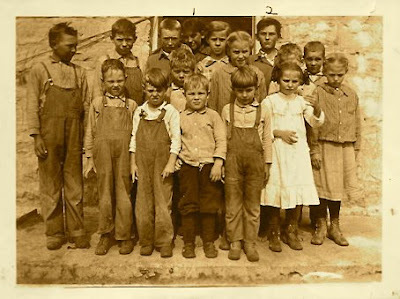 A view of the children in Minnie G. Frey's school, taken in October 1918. 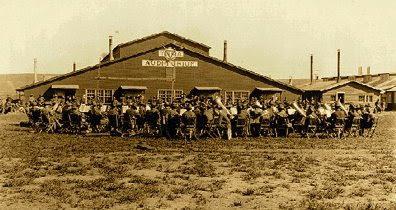 A view of the Sherman Township school house where Minnie G. Frey taught school during 1918-1919. This view was taken many years later after someone had added an anteroom over the front door and taken up residence in the school. I write Minnie about camp activities, voting in the national election, and close with a poem. I am still in good health, well fed, but anxious to get away from here. It is very tiresome waiting for something to happen when you don’t know what it is. I got back to camp all O.K. Sunday evening & nothing was said about overstaying the pass. Last night Ralph Currie & I went to the picture show down to the “Y.” It was the first show I had seen since that night before I left for the army. We had to stand up outdoors to see it but we were glad to do that even. The pictures were only fair. Before the pictures, we sang songs that were thrown on the screen by slides. Today we fooled around the whole morning voting [in the national elections]. They would line us up to march us over to the polls & then fall us out for awhile & then line us up again. Finally we went over to the “Y” & just before noon we got to vote. You must be a good schoolteacher or the children wouldn’t be anxious for school to begin again. I don’t see why you want to tell me why you have a trade last for me & then not tell me what it is because if you are planning on waiting until you see me, it may be so long that you will forget all about it. Tomorrow is inspection again & we always have it on Saturday too. If we have a dirty gun, that means no pass! So if I don’t get a pass next Saturday or Sunday, it may be from other reasons than that I am transferred. I saw that picture today that I told you about. It is fairly good but would have been better if the camera had been closer. The man said he was going to have several struck off so if both of us are still in camp by the time they are finished, I will have some. Like you, I hope those we took Sunday are all right, if I don’t get transferred away from here, I want to have my photo taken as soon as I get my other clothes fixed up. [P.S.] I hope you are having good luck with your school & don’t get lonesome up there by yourself. My visit home was about half dream & about half reality. I don’t know which. It’s the faith of a little girl like you that counts when the world goes wrong. When a fellow’s down & mighty blue, and his lips can voice no song, when the loneliness seems hard to hear, and the scheme of life seems tame, it’s knowing somehow that still you care, that makes a fellow game. It’s girls like you that keeps men straight, keeps them white clear thru & clean. It’s girls like you that keeps men great, and not what they might have been. Oh it’s good for the man when all seems night, when the clouds hide the goal from view. Just to knuckle down & fight, yes fight, for the sake of a girl like you. Ralph Alexander Currie was the 22 year-old son of Charles and Nancy A. [Fleming] Currie who lived on Osage Street in Manhattan, Kansas. He was born 24 October 1896 in Garrison, Kansas, married Katherine A. Ryan on 3 June 1922 in Topeka, and died June 1980 in St. George, Kansas. October 25, 1918, may have been the single most decisive turning point in Wilson’s entire eight-year presidency. Before that date, he enjoyed bipartisan support as a war leader for the entire nation. Then, with just ten days before the elections, he released a note calling for the return of a Democratic Congress as essential to the nation’s security. Wilson’s questioning of the Republican party’s patriotism turned what had been a listless campaign into a heated contest. On November 5, Republicans swept the congressional elections, compiling a two-seat majority in the Senate and a forty-one-seat margin in the House. Local issues, the tendency of the president’s party to suffer losses in midterm elections, and dissatisfaction with Democratic legislative accomplishments accounted for some of the Republican gains. But the bitter and egotistical tone of Wilson’s plea also made a difference. For Wilson, the worst consequence of the election was that it placed his Republican nemesis, Henry Cabot Lodge, in two vital Senate posts: majority leader and chairman of the Committee on Foreign Relations. His subsequent failure to work agreeably with Lodge to secure ratification of the Treaty of Versailles ultimately doomed his presidency and set in motion the ominous chain of events that tied the first world war to the second. Minnie writes me about school activities, making up for lost time, and some Halloween shenanigans at the Sherman Township school house. Well school went off real smooth again. Children seemed ready to go to work. Two of my primary children have quit. The little fat boy that I thought so much of has gone to Manhattan to live and the little five year old girl has been sick so much they decided not to send her anymore this winter. I guess I will make up my school on Saturdays. The patrons would rather not have the last time made up than keep the children in school longer in the spring. And the children all seem willing to go on Saturdays. So I’m going to see the school board this week and if it’s all right with them, that’s what we will do. It will suit me just fine. I won’t have to pay any extra for my board and I can go home on Saturday evening instead of Friday. That will be alright. I was sure surprised yesterday morning when I opened the schoolhouse. I left it just as clean as could be – everything right in place, dusted well, etc. When I opened the door everything was in a mess, pencil boxes turned upside down on the children’s desks and everything about the schoolroom out of place. The first thing I thought was that they had been fumigating the schoolroom. I know the State Superintendent asked all schools to do so. But when I walked in I knew they hadn’t been, but someone had been real smart. The lamps were taken off their racks and put on my desk, the water jar put on my desk, nearly all my books put on a heap on my desk, and the contents of the desk drawer thrown on top. I had a couple of pair of stockings up there so if I should get my feet wet this winter during bad weather I could change them before school in the morning. They were pulled apart and thrown on top of my desk. Then they had tobacco strewn over everything and burned matches (a dozen or more) on the floor around the desk. They had spilled ink on the school register [and] marked on the report cards. They had my flowers on the floor under some of the desks. Well I didn’t know what to think. I couldn’t do anything for awhile. Then I heard the children coming down the road so I decided if they had a hand in it, I would have everything all cleaned up and act as tho nothing had happened. But none of the children had a hand in it, I found out. Every large pencil was taken and two fountain pens, and a pearl-handled knife. We thought possible they were hid but we can’t find them anywhere about. They wrote my name in the Library book and scratched all over the page with black ink. They spelled my name Fry, so it was someone that didn’t know me but knew what my first and last names were. It was one of the new books. I hate it awful bad and everything on my desk and in the desk drawer smell so strong of tobacco that I would feel so ashamed if anyone was to visit my school. They would think I was a habitual smoker, wouldn’t they? They also stole our box of matches. The children think it was some boys out Halloween night. Parkerson’s think it was Charlie Scott for one and some other boy with him but we can’t imagine who. That Charlie Scott is a regular pill. Anyway he thinks he acts awfully smart. He’ll stand out in front of the school house when they are working roads and cuss a blue streak, walk crazy, and everything else to make the children laugh. Charles H. Scott was a 21 year-old farmer in Sherman Township, Riley County, Kansas. 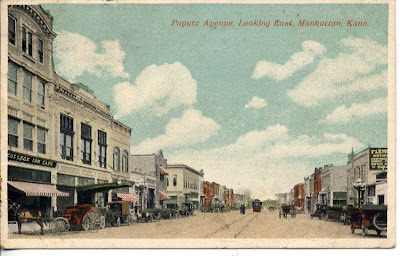 A view of downtown Manhattan, Kansas (looking East) about 1918. The interurban railway trolley can be seen on the tracks that ran from Poyntz Avenue all the way to Junction City. Minnie writes me that she is back at the Parkerson's farm in Sherman Township and ready to start teaching again on Monday, November 4th. Well I am back at the same old table writing my daily letter as usual. It seems good to be back. Children are anxious for school to begin; I’m surprised but glad of that. I suppose you got your [interurban railway] car and are safe back at camp. Mrs. Parkerson says it seems nice to have me back. That’s the kind of a greeting I like to get. I guess she thinks she has someone to gossip with now. We sure talked some tonight. If we have anything to say, we sure say it as fast as we can. [We] only take time enough between stories to get our breath – not like you and I, are we? Today has sure been a swell old day – just perfect. I wish we could go for a long walk on just such a day as this has been. I had the most fun this morning and afternoon riding. [I] had a dandy horse and it was such pleasant weather. I guess I was gone three hours or more. I hope those pictures we took this afternoon were good. I left the roll and told [my sister] Bertha to have them printed this week. I’m going to try to get home early enough next Friday evening to see Bertha off. She don’t leave till sometime around six o’clock. We think we can make it. Well I must make this letter short and hike to bed. It’s a quarter after nine and at seven I was so sleepy I almost had to prop my eye lids open. I do hope [your brother] Willis’ hand gets alright and they won’t be put out too awful much. I know Papa and the boys will do all they can but at the best they can never make it up to Willis. Papa feels awfully bad about it. If he just hadn’t asked Willis for gas, it never would have happened and it spoiled your visit to a certain extent. I sure am sorry it had to happen. We were all so happy before [it happened], weren’t we? There was a letter and a card from you here when I came today besides several other letters from Co. Supt., Colleges, etc. I’m anxious for the time to fly by. I want to see where you are sent and for the war to end. In the letter I got today, you told about your foot being so sore. That sure must have been awfully painful. You can stand the most and be the most cheerful about it of anyone I’ve ever known. I have another fine trade-last for you Ward – the very best yet. Let me know about your transfer as soon as you can, boy. Wonder what we were doing this time last night? Goodnight dear boy and good luck to you. Your sweet heart, -- Minnie G. F.
A “trade-last” is a favorable remark that one has overheard about another person and offers to repeat to that person in exchange for a compliment overheard about oneself. Minnie writes me from her parents farm near Manhattan. She tells me she is learning to knit. 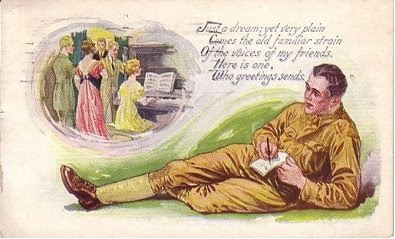 I had two letters from you yesterday – the one you wrote Tuesday evening and the one that had been held at Camp Funston. I’m going to write this morning. It was so late when I got home last night, I thought I had better go to bed. You wondered what we were to do last evening Halloween. My, I had so many social engagements; I had to cancel them all. There’s so much doing, we are certainly in a whirl. I didn’t do much on my outline yesterday as I had intended. I decided yesterday morning I wanted to learn how to knit, so I got Mama to teach me. I like it better than anything else I have done that way. I think I’ll do that all my spare time this winter. I’m ashamed to think I haven’t learned before, but Stella [Munger] and I were so busy last winter, we didn’t have time when other girls were learning to knit. Yesterday afternoon, [my brother] Wayne wanted me to go to town with him. I wanted to get a few things so I went. And just my luck – Stella [Munger] came while I was gone. So I only got to see her about half an hour. I guess we sure are going back to our schools Monday. It will seem almost like beginning all over again and our work will be awfully mixed up, I’m afraid. But I don’t mind. Mama, Wayne, Lester, Bertha, Ruth and I all went over to your home last night. Willis brought out the little bottles of grain. We went over them first and he told me what he thought I would want. Then he got the labels and we printed the names and put them on the bottles. It was fun. I’m glad they were not fixed up before. Willis was sure good about it. He said he didn’t think you wanted to sell them and I had better bring them back with me when I leave my school. So if you want them, I’ll sure take good care of them and bring them back. I sure am thankful to get them. It sure saves me a lot of work and time and then I wouldn’t have a collection like that. If I can complete my collection this winter the way I want to, the children will certainly be interested in that work. Those children seem better about fitting right in and taking up what I might start than most any of the schools I have known. I thought when you left here [last] Sunday you intended to go back to Camp [Funston] that evening. So I didn’t look for you back here hardly. A least I made myself believe you were not coming so I wouldn’t be disappointed if you didn’t. My I wish you could have come back again. The time you were here, Boy, sure flew by. And if we hadn’t had company, I’m afraid I would have felt awfully bad when you left. It was gloomy and lonesome. We certainly do owe you an apology, Ward, for not offering you any supper Saturday night. We never once thought of it till last night and from what you said about time you left camp, etc., we concluded that you didn’t have anything to eat that evening. That certainly was a bone head on my part and I wouldn’t have been so forgetful for anything. Willis said, “Believe me! When I get a girl and go to her home if I’m hungry, I’m going to ask for something to eat.” I wish Ward would do that too if his girl hasn’t got sense enough to give it him without his telling her. I guess I’ll make a rule of asking you every time you come if you have had your last meal, then I’ll not do anything like that again. Your mother is certainly looking and feeling more like herself and Willis is just alright now. I don’t think you need to worry anymore about them. I’m certainly glad they were so lucky. I still keep well but there seems to be no news. I received a dandy box of candy from you today but it is all gone now. It sure was fine. 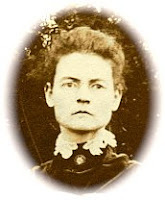 I send my mother and brother a short letter to let them know I am done with the special training at Smoky Hill Flats and am back in the Detention Camp awaiting news of our transfers. Well, this is Halloween night. I suppose if I was home I might be at some party somewhere but I’ve had my last party for awhile, I guess. There is no news since I wrote last so this letter will be short. I had to turn in my overcoat, gloves, and sweater when I left Smoky Hill Flats and I can’t get any over here so I get pretty cold sometimes. I haven’t gotten my winter clothes and I don’t know when I will get them either. Our company was on guard the other night and there were three of the men posted to guard the prisoners. When it got dark, three prisoners escaped and these three guards that were supposed to be guarding the prisoners are now under arrest. If the prisoners are not caught, it will go mighty hard with them. Men are still being transferred out of here and I may be yet. I haven’t drilled since I have come back. I hope that Willis has found all the calves by now. Minnie writes me that the flu has gotten worse in Manhattan and that her school may get canceled yet another week. Received the letter today you wrote Saturday and Sunday evening; also two cards from you. It sure seemed nice. My, but I’m glad you got back and it was alright. Wasn’t it nice tho for them to have the stove up and everything sailing. I was awfully surprised tho when your mother said this morning that you left about 2:30 Sunday afternoon. I supposed you stayed all afternoon anyway. I was downtown this afternoon, saw [your brother] Willis for the first time since he’s been sick. He doesn’t look any the worse for it, does he? I wish I had of seen him before he shaved his mustache. I bet he sure looked funny. I was going over tonight, but it was pretty late when I got home and the horse was out in the pasture so I didn’t get to go. I called your mother and told her I couldn’t come tonight but would tomorrow. She called later and wanted me to come tonight if I could [since] Willis wouldn’t be at home tomorrow, but I couldn’t so I’m going tomorrow evening. I got a lot of my book outlined today. It seems like I might be going to school doing that. I sent you a box of candy today. Be sure to tell me when you get it because I sent it insured and I’ll get my money [back] if you don’t get it. But of course you will. I wanted to send you some and it’s so hard to get sugar. I had to buy the candy instead of making it. I’d rather make it – it’s more fun. I expect you are all nicely settled back at D[etention] camp, aren’t you? The influenza is worse here in Manhattan again, much to my sorrow. I may not have school again next week. Isn’t that the limit? I hope I do tho. I don’t want to teach a whole extra month next spring, especially if you are at Camp Funston. I want to get home so I can see you as often as I can. If you are moved down to Camp Funston next week, you’ll not be sent away very soon will you? That will sure be great if you can go down there and be in the barracks. Soon you’ll feel like you are in a palace, won’t you, after being in those tents and a little candle light at night, and land knows what else. Then you will probably get off every weekend. The next quota for Riley County is 77 men. That’s quite a few. I don’t see who’s going to do the work next summer – we girls I guess. Minnie writes me again from her parents farm near Manhattan. She says she is anxious to resume teaching in Sherman Township but the Riley County schools remains suspended due to the influenza epidemic. Nothing much to write about, just the same old routine. These letters are so spicy I bet you just fall head over heels to get them. I have just so much to do; I don’t know how to plan it to get all done. I’ve been fooling around the last two weeks and this week I know I must get busy to get everything I want to done before I go back to school. I’m going to spend most of the time writing that book review. I want to get it finished as soon as I can because when I get back up there I want to spend most of my evening’s knitting. I talked to your mother this morning. You didn’t get a very long visit at home, did you? It would have been fine if you could have had a pass till Monday morning. We are hoping you can get off most every weekend, but of course you can’t tell. I’m going to your home this evening to get those [grain] samples. I sure am glad to get them, boy. I asked you once how much you wanted for them but it was quite a long while ago and I’ve forgotten what you said. I should have paid you Saturday evening but didn’t think of it. You tell me how much – maybe your folks will tho – and I’ll pay you the next time I see you. I’m sorry to have bothered you about them – you not being at home. [My sister] Bertha is going to live at Fall’s Church, Virginia – a little town out from Washington [D. C.]. An electric car line goes out there. [Her husband] Charlie [Scholer] says the country is so pretty around there. They can get rooms much cheaper out there and it will be just as nice for Bertha and [their infant daughter] Ruth and may be nicer. 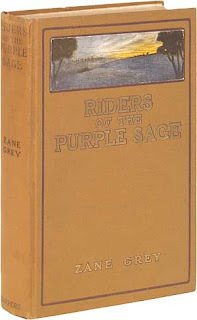 [My brother] Wayne has a new book – “The Riders of the Purple Sage” by Zane Grey. He thinks it is fine. I want to read it if I get a chance before I leave or take it with me. Ross Arnold goes up to Ogden every two weeks. You know Rosa lives up there now. I’m surprised that she doesn’t have a soldier boy living close to the camp. Just now heard Bertha say it was getting awfully black in the west. I sure wish it wouldn’t rain. We had enough moisture today for months I think. Good bye, dear Boy, -- Minnie G. F.
Riders of the Purple Sage (1912) has been called the most popular western novel of all time. It is set in the mysterious canyon country of southern Utah, and the rugged landscape the novel inhabits is more than a backdrop for the action. Villains and heroes both try to use the stone labyrinth to their advantage, but it is the landscape's power and majesty that dictate the final result. Portraying the conflict between Mormon and non-Mormon settlers over the possession of land in the 1870s, the novel questions the right of a religion to tyrannize its followers and deprive them of freedom in the name of good. 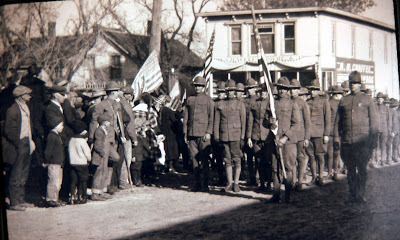 Follow along as Ward C. Griffing is inducted into the infantry during WWI while his sweetheart, Minnie G. Frey, faces her first year of teaching school in a one-room rural schoolhouse in Riley County, Kansas. Please note that the entries on each page are in reverse order, oldest at the bottom. Readers interested in following the letters in chronological order should therefore start with the oldest blog post and scroll upwards. 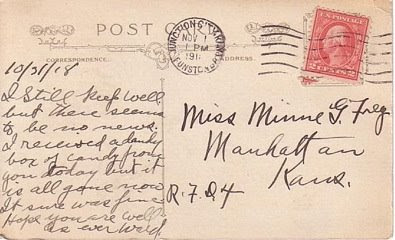 If interested only in reading the letters or postcards written by me, click on "Ward" from the labels list at the bottom of the page. If interested only in my sweetheart's letters, click on "Minnie." Use the "search" feature in the upper left corner of this blog if you are looking for something or someone in particular. I was born July 30, 1897 in Manhattan, KS to Will and Hattie Griffing. I had two sisters whose names were Augusta (Gussie) and May, and a twin brother named Willis. At the time these letters were written, my father Will and my sister May were deceased. Gussie lived with her husband near Washington D.C. and May's daughter, Carol Cunningham lived with my mother Hattie and brother Willis on the "College Hill" farm northwest of Manhattan. Readers interested in life at Camp Funston, Fort Riley, Kansas would enjoy the "Reflections of Army Sergeant Charles L. Johnston" who was a member of Ambulance Company 239, 10th Sanitary Train. He nursed soldiers during the influenza epidemic of 1918-1919. Ward Griffing's paternal grandparents came to "Bleeding Kansas" in 1854 shortly after passage of the Kansas Nebraska Act. Letters exchanged between this couple -- some 500 of them written between 1841 and 1882 -- can be found in the website; Private Letters, the Correspondence of James S. Griffing and J. Augusta Goodrich. I have found the experiences of Sgt Sam Avery during WWI to be very interesting. 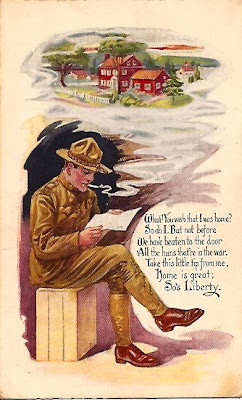 You can find them at Soldier's Mail, Letters of a New England Soldier 1916-1919.